I cannot believe how cold Madras has become. The mornings are so chilly. This is something unheard of here. By ten o’clock though, the sun comes out in full blast. These extremes are ruining my already wonderful skin. Nights are even colder. I used to make fun of my mother for wearing socks to bed. Now I sleep with the fan turned low and snuggle in to my purple quilt. 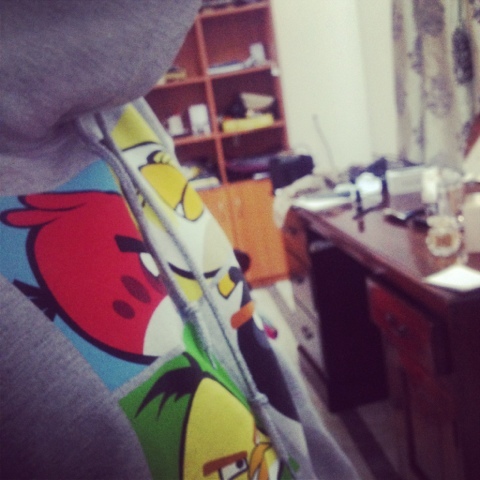 The only thing keeping me warm is my new awesome Angry Birds sweatshirt that The Brother so lovingly got me. It’s so big! And soft! Perfect for the weather. He also got me an iPhone and this post is a test run on the Blogger app. Hopefully, this will motivate me to blog more. Okay I have to go wash the henna off my head but before I do I want to ask you, do you l know what the Tamiil version of Angry Birds is called? Ans : Jangry (jangri) Birds! Yes, I’m not called Mokkaisamy for no reason.